Anabaptist Mennonite Biblical Seminary (AMBS), a seminary of Mennonite Church Canada and Mennonite Church USA, serves the church as a learning community with an Anabaptist vision, educating followers of Jesus Christ to be leaders for God’s reconciling mission in the world. AMBS’s accredited study programs integrate academics, spiritual formation and practice to prepare leaders to serve in various contexts or pursue further study. Areas of study include pastoral ministry, pastoral care and counseling, Christian faith formation, Bible, peace, history, theology, ethics, Christian spirituality, conflict transformation, international development administration and environmental sustainability leadership. Through the Church Leadership Centre, AMBS offers lifelong learning options such as workshops, face-to-face and online short courses and webinars on theology, ministry and pastoral care, in addition to two undergraduate-level leadership development programs. 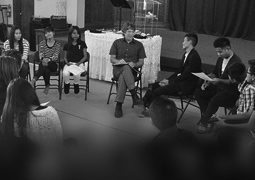 A ministry exploration program for youth is administered by the seminary’s Centre for Faith Formation and Culture. 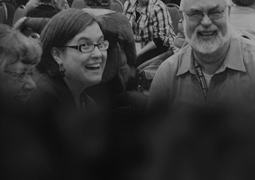 The Institute of Mennonite Studies, AMBS’s research agency, administers avenues for dialogue, scholarship and publication on topics and issues vital to Mennonite congregations and the Anabaptist faith tradition. Canadian Mennonite University, located in Winnipeg, Manitoba, is a Universities Canada accredited Christian University in the Anabaptist tradition, offering challenging programs and degrees in undergraduate and graduate studies. CMU’s Shaftesbury campus offers undergraduate degrees in arts, business, humanities, music, sciences, and social sciences, as well as graduate degrees in theology, ministry, peacebuilding and collaborative development, and an MBA. CMU has over 800 full-time equivalent students, including those enrolled in degree programs at the Shaftesbury and Menno Simons College campuses and in its Outtatown certificate program. We value excellence in teaching, challenging academics, rigorous thinking, strong community life, and practical preparation for a career. We do this within a framework of faith in God, and with the conviction that faith makes a difference. Challenging mind and spirit: Conrad Grebel University College is a liberal arts college founded by the Mennonite church and affiliated with the University of Waterloo. The College offers undergraduate courses in Arts and is home to the University’s BA programs in both Music and Peace and Conflict Studies. A graduate program in Theological Studies engages students in the study of faith and spirituality and prepares them for church ministries or doctoral studies. The Master of Peace and Conflict Studies places a unique focus on the pivotal role individuals within civil society play as catalysts for peace. The Conflict Management Certificate Program offers skill-based conflict management training in mediation or congregational leadership. Offered by MCEC in cooperation with Grebel, the Anabaptist Learning Workshop facilitates life-long learning at the intersection of Christian faith and contemporary life. The Milton Good Library and Mennonite Archives of Ontario support the College’s teaching and research, particularly in music, peace, and Mennonite studies. The Kindred Credit Union Centre for Peace Advancement is an innovative and collaborative academic centre committed to research, training, and community engagement around multi-sector peacemaking issues in our world today. Grebel’s residential and student services programs build a unique sense of community by providing a supportive and stimulating environment for personal, social, intellectual, spiritual growth, and leadership development. grounded in Mennonite tradition and fully accredited by the Ontario Ministry of Education, Rockway welcomes students of all faiths and perspectives, and encourages respect and curiosity amid diversity. Our learning community of 260 students in Grades 7-12 benefits from our rigorous academic program, nurturing Chapels and Religious Studies courses, dynamic international student exchanges, enhanced community service opportunities, and enriched experiences in the arts and athletics. We teach to the heart as well as the mind, preparing students to be responsible, globally-minded, compassionate, and reflective learners. Rockway’s graduates are not merely ready for the real world; they are also committed to build a better world.